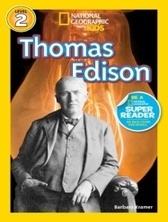 Thomas Edison, my biography for early readers, was released by National Geographic this month. The book is part of a series and one thing I like about the format for the series is that there are many short sidebars throughout the book. It meant I was able to include tidbits about Edison that I found interesting, and hopefully, my young readers will agree. Those extras include quotes from Edison in sections called “In His Own Words.” I thought finding quotes would be the easy part of my research, but it didn’t turn out that way. I quickly discovered that many quotes from Edison have been corrupted over time. How does that happen? Sometimes it’s because someone tries to simplify a long quote. Other times, educators feel it’s important to correct a famous person’s grammar. I guess they don’t want kids to associate bad grammar with greatness. Or sometimes, it’s just human error. We make mistakes in copying something and don’t always catch them when we go back to check. For whatever reason, I had several versions of some quotes and no idea of which ones were right. Fortunately, I found a book called The Quotable Edison (University Press of Florida, 2011) by Michele Wehrwein Albion. In the 1990s, Michele was curator at the Edison & Ford Winter Estates in Ft. Myers, Florida. In that position, she saw first-hand how often Edison was misquoted. That led her to undertake the huge job of tracking down the original sources of the quotes. Michele combed through the Thomas Edison Papers. With help from librarians and archivists, she also hunted down magazines and newspapers of Edison’s time to find the original copies of interviews with him. It was a lot of legwork, but the result is a carefully footnoted book of quotes. It was a great resource for my book. It is also a fascinating read with quotes that provide interesting insights into Edison’s personality. Edison often talked about the value of hard work. “Genius is all bosh. Clean hard work is what does the business,” he once said. Although Edison was serious about work, he also had a sense of humor. He enjoyed playing practical jokes often at the expense of the press. An example was the time he talked about “inventing shirts made of thin sheets of gelatin that could be worn for a day, then peeled off and discarded.” He later joked that people had already sent him checks for the shirts. As Edison became more famous, reporters wanted to know what he thought about almost everything. Edison seemed more than happy to give his opinion. As a result, The Quotable Edison is rich with his thoughts about politics, presidents, inventors and inventions, and even the possibility of communicating with other planets.